Bindin gs can either be straight cut or biased. Straight cut binding is cut parallel to the selvage of the wide material and is made as a continuous roll by joining the individual cuts. These cuts are frequently referred to as ‘baloney’ cuts since the roll is put onto a cutting machine and ‘slices’ are made with a large steel knife that cuts through the material to the core. With Sunbrella material the ‘slices’ are pulled into a box and joined together at the beginning to the end by stitching with either matching or contrasting thread Biased binding is manufactured by stitching the two selvage ends together creating a ‘tube’ of material that is the length of the entire roll. This tube is then put over the arms of a biasing machine that pulls the material and cuts the edges at a 45-degree angle. The roll is then cut into slices and joined together. Vinyl binding is heat sealed at the seams and joined together to form a continuous roll. The width of the finished binding is determined by the requirements of the end user. Some want a slight reveal of binding and may use a 7/8” or ¾” finished binding with two edges turned. Others might want or need a wider width – 1”, 1 ¼” (or wider) offers a matching or contrast edge on a finished product. Hidem or gimp allows the end user to finish a seat by butting two raw edges of flat material together and positioning the Hidem over the seam. The Hidem is made by rolling two raw edges of binding over twice while topstitching the face side. The center can then be rolled open and a staple or tack can be used in the center of the trim. When released the Hidem folds back over the tacking mechanism and the seat has a finished appearance. Welt or piping is used as a decorative trim between two edges of material. It can be matching using the same material color and specification as the seat itself or can be contrasting using materials that complement or contrast the seat cover. Old style welt was a plastic extrusion, often stiff and did not offer many of the design elements available with current styling. 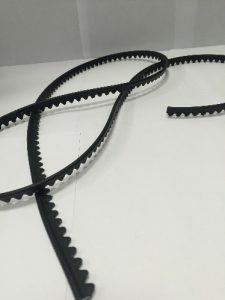 Fabricated welt can be made by cutting strips of vinyl or cloth that is then glued or stitched around a cord (rubber EPDM cord, puff cord, cotton cord, polyethylene, or ploy propylene). Since the bead is what is seen on the edges between fabric or vinyl, the end user determines what size bead it should be. The sewing tab or apron of the welt must be sufficient to anchor it into the finished product and yet not be too large to fit smoothly under any rounded edges. For the last several years OEM’s have added contrast welt to the design of automobile seat covers. This contrast welt can be seen In the Hummer, F-150, Yukon, Audi, Mercedes, Fiesta, Sebring as well as other models. That is good news for distributors – since restoration shops will add welt to their list of needed items. Boats have used welt and Hidem for many years and the availability of choice of color and size open up an opportunity for additional sales. Another example of creative use of welt was created when the two interior covered wall panels were attached on Sea Ray (and other boats) and the space between the two walls needed to be covered. We created a welt with a large 8/32 bead and trimmed the sewing tab back to the bead. Sea Ray then glues the tab-less welt in the seam to cover the ends of the wall panels creating a completely finished wall. We often cut binding and sell it as a raw edge to be used as a reinforcement under French seams. We make typar out of polypropylene that can be sold as a raw edge or folded item that can be stitched with or without a cord. This typar can be then sewn into the bottom of a seat cover that can be drawn up to make the folds even. Bindings are used to finish boat tops, convertible tops, the headliner in a convertible, trim around car mats. Some more unique applications include binding on grave covers, accessory or bag items, dog diapers, baby seat covers, instrument bag covers, gun covers, furniture covers, etc. Binding can be folded in half and stitched as used as straps for apron strings, bags (functional or decorative) – by making them narrow or wide – plain top stitching or fancy top stitching. IF YOU DO NOT SEE WHAT YOU WANT ON OUR WEBSITE, PLEASE CALL US AND TELL US WHAT YOU NEED!